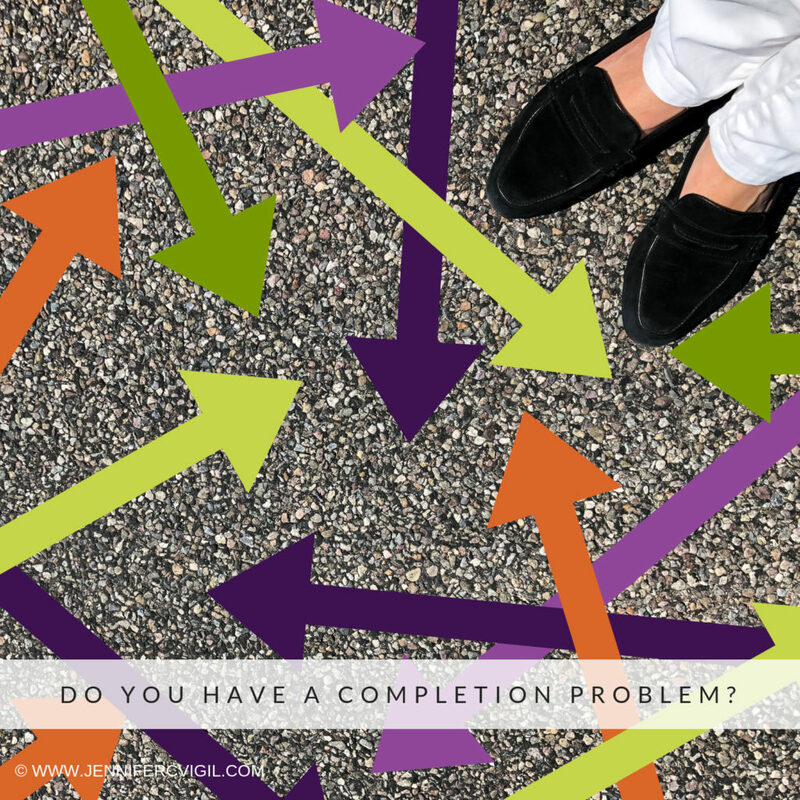 Do you have any uncompleted projects that are weighing you down? You know, that one you started so long ago you don’t know how much time has passed, but that still makes you cringe when you think about it. Has it really been years? Some of them are just little things, small tasks that you either haven’t made the time for or have started but needed something else to complete it. I have lots of little household projects that fall into this category. The broken outlet cover I meant to replace but just keep forgetting to pick up at Home Depot. It’s in a hallway that I only notice when I plug in the vacuum and yet I still haven’t replaced it, ugh! I swear I am going to electrocute myself trying to pull out a plug. I also suspect that the outlet needs to be reset/ rewired in the box which is why the covers have broken in the past. I know that this really is a longer project then it seems. If you are like me, you have a list of all the small things that need to be fixed around the house that just seems to get longer. Or it could be more personal, like that thank you note that you have meant to write to your best friend for the crazy perfect birthday gift she got you. You’ve meant to do it but you don’t have any thank you cards or a card you like, and you haven’t picked one up yet. And well, months have passed and it seems silly to do it now. You rationalize that well, you did gush at the time and tell her she’s amazing, so that’s good enough, right? In your heart, you know that you really wanted to show her the same thoughtfulness that she did by sending a heartfelt thank you note. My inner dialogue tells me I am a schmuck for not getting it done which is the beginning of a shame spiral, cue the Brené Brown video on stopping shame spiral. The book you started. Lots of notes, character sketches, an outline even but still years later it isn’t done. Making that new body of artwork. Lots of notes, sketches, and you bought the materials you need but still haven’t gotten the results (or maybe no finished pieces) yet. Consistent social media posting for your business. A photo album of the trip you took with your BFF. You swore to yourself that you were going to give it to her for her birthday, then as a holiday gift and yet you still haven’t gotten it done. Convert the spare room into a studio/ office. Big or small, these projects take there toll. They become mental clutter that trips you up and weighs you down. They represent a broken promise to yourself. The consequences–if you can’t honor commitments to yourself, how can you follow through with others. You are basically telling yourself that you don’t matter. It slowly can erode your self-esteem. We become desensitized to our mounting pile of unfinished projects, or so we think. We get used to the status quo and start to accept a level of chaos, no matter how small, that slowly alters us. The more we tolerate the slippery slope of chaos, the lower our personal standards are. We start tolerating and rationalizing that “it is ok” or “it’s not that bad.” As we expect less from our environment, we also get comfortable expecting less from us. Most importantly it adds to a general sense of overwhelm and anxiety. All the little projects add up. Add the large ones and progress on any front suddenly feels impossible. Cue full-blown OVERWHELM. I recently realized just how much my unfinished projects were and are holding me back. 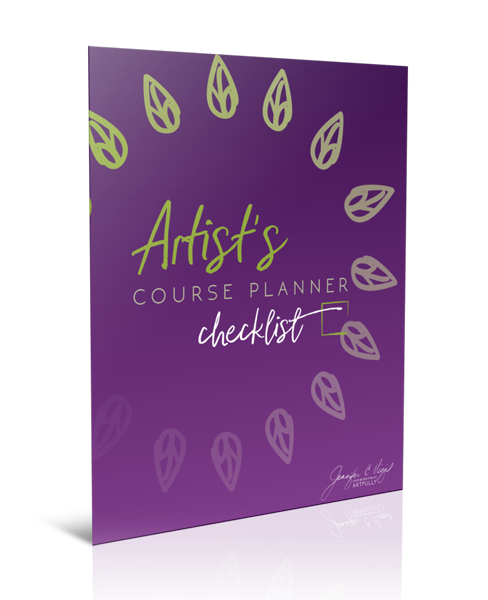 I have lots of running to do lists–ones for house projects, one for my business, one for my studio and another for my artwork. They are in notebooks, on sticky notes, on slips of paper on my desk, and in an effort to corral them, even in Asana (online/ app project management tool which I am not consistent in using. I use it for months and then get out of the habit. Add being consistent with Asana to my list.) I come across small items that should go onto one of the lists daily. 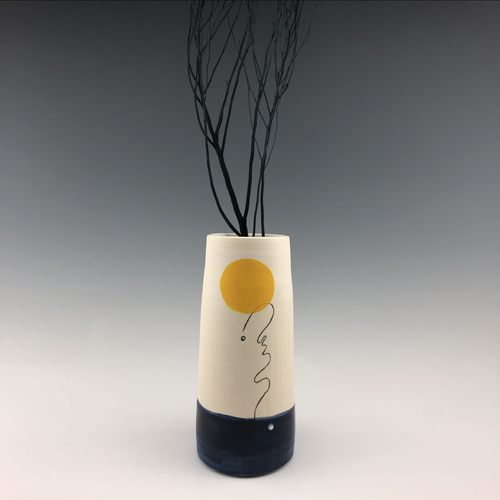 But it was one large studio project that resulted in my summer “come to Jesus” moment on why I needed to make a habit of slowly taking on my unfinished tasks. We moved into our current house in 2007. One key feature that sold us on this house was that I could build a studio in the oversized third garage stall. It even has windows that face the fountain in the front yard so I would have lots of natural light and a pretty view. Within the first year, we walled off the third stall, and added a ductless air conditioning system (it’s Tucson after all, so no way to make it through summers without it), added more outlets, shelving, and had a special outlet installed for my kiln. All I needed to add was a sink. I found a good deal on used kitchen cabinets at the Habistore. Thank you, Jimmy Carter, for Habitat for Humanity and now the salvaging of building supplies by the Habistore that make decking out a studio a bargain. (In case you are curious…$1/in width. Three cabinets just $76.) I decided I would create a mosaic countertop. My fatal error! I love snorkeling, so my vision was to have a coral reef mosaic scene that moved across the countertop down the cabinet face becoming a painted mural on the doors. I talked to a mosaic artist friend for her suggestions on the best way to create the underlying counter surface. I followed her instructions and was all set to start making mosaic tiles. 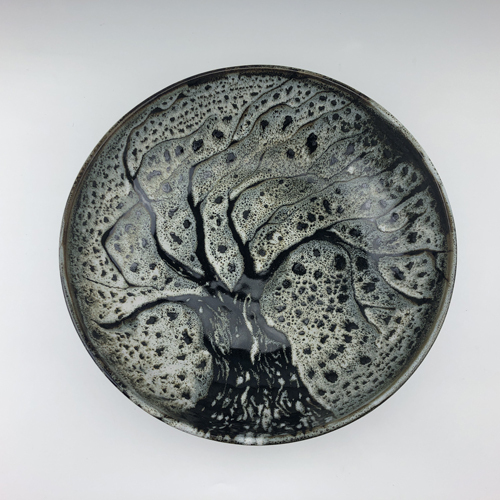 I made a template of the surface, began making drawings, and checked out lots of books of coral reefs. But then my other studio work began to take priority. My drawings got tucked away somewhere and eventually got lost. Fast forward 9 years…and it still looks the same. This summer I wanted to rearrange my studio so I could access other materials more efficiently. 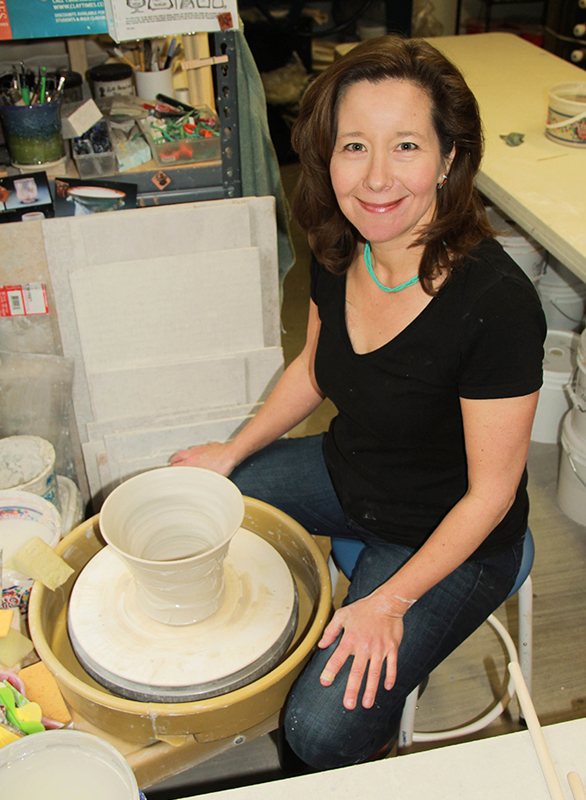 For years my studio has been set up for ceramics. I always had lots of different art supplies, but they were not easily accessible. Clay reigned supreme which made it more difficult for me to work in any other media. It was just a hassle to dig those items out, get set up, and then put it all away (often on shelves high up and this Queen of the Munchkins has to pull out a serious ladder to do that). 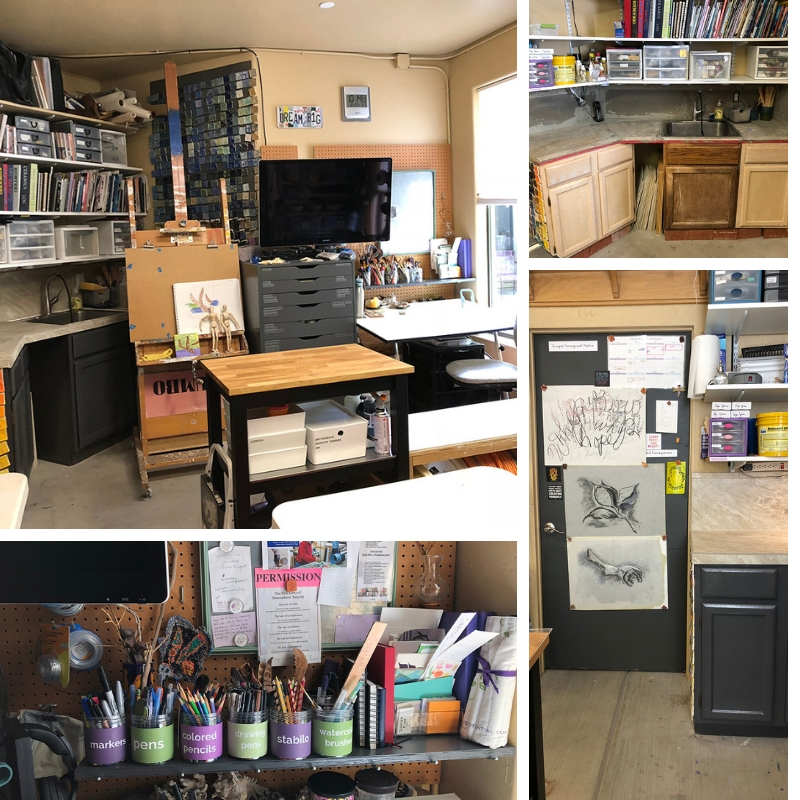 So this summer I spent time reorganizing my studio, adding new storage drawers, and creating zones for different processes (mold making, encaustic, clay, sculpting in wax, painting, and drawing). 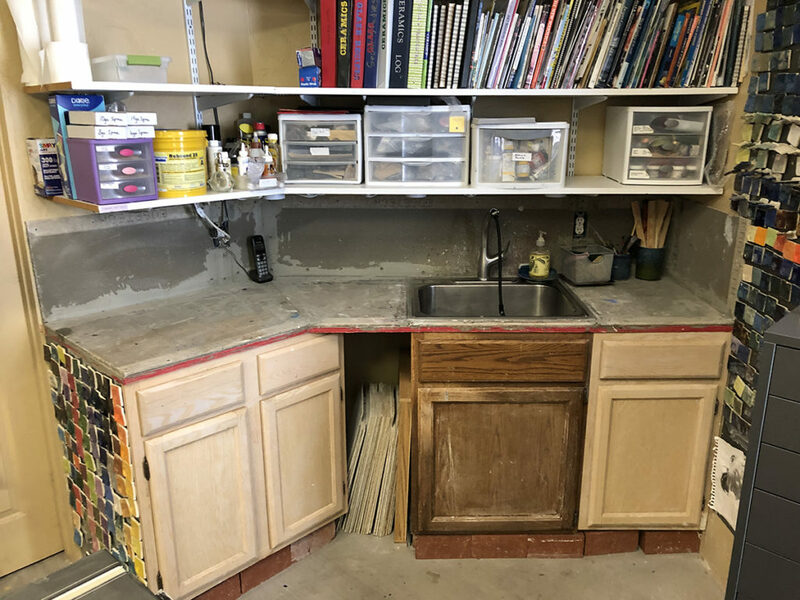 As I pulled items off shelves and out of cabinets, I could no longer ignore the elephant in the room–the major unfinished project, my sink countertop. How long had I lived with this? Was it really 9+ years! OMG, why couldn’t I get this done? I knew what the problem was, but I just didn’t want to admit it. I had a major anchor problem. 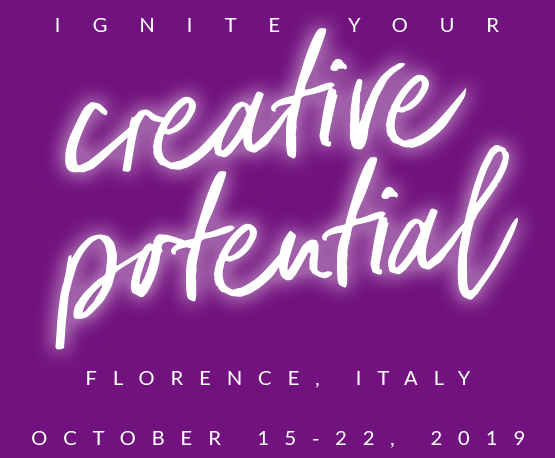 Bill Burnett and Dave Evans talk about anchor problems in Designing Your Life: Build a Life That Works For You. 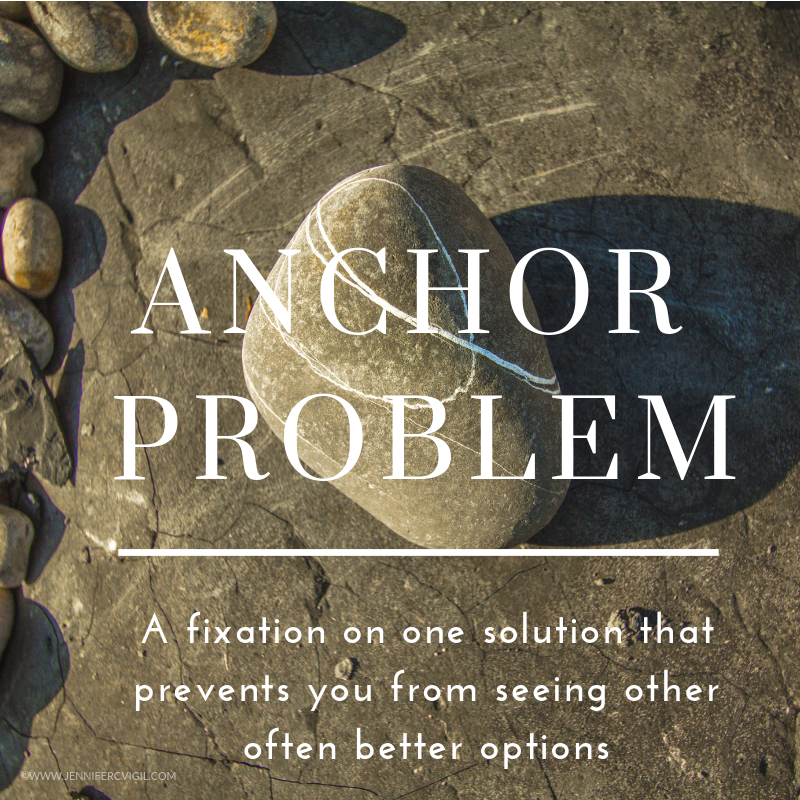 An anchor problem is one that keeps us stuck because we are fixated on one solution, unable to see other alternatives. When I read about anchor problems this summer, I had an epiphany. I had a huge one that was weighing me done and I knew why. I saw it every day when I went to the studio, and it was a constant reminder of yet another project with a grand vision and no execution. I had this image in my head. The perfect colorful coral reef brightening up the dark sink corner of my studio. I imagined that every time I would look at the finished mosaic, I’d be transported to my favorite snorkeling spots in Hawai’i and Puerto Morales, Mexico. Anything less than that just wouldn’t do. My myopic view on a solution was compounded because of choices I made early on in the construction process. 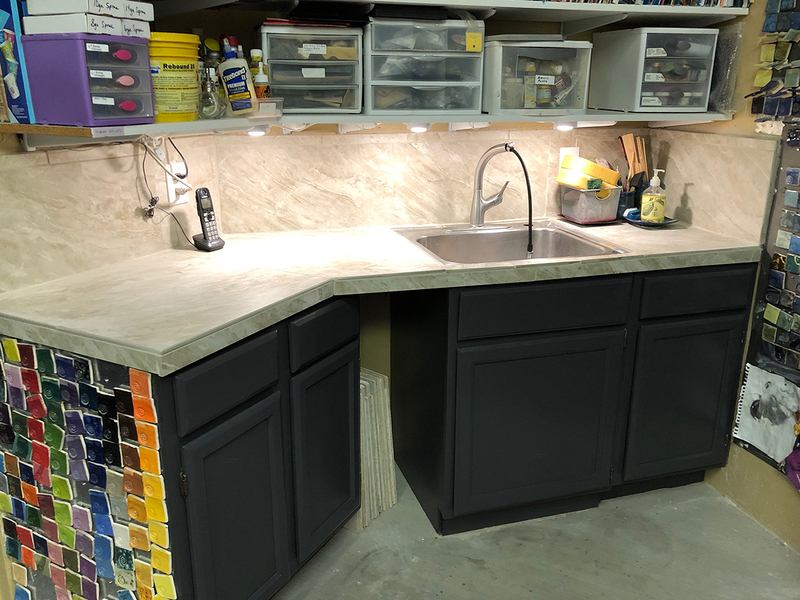 I couldn’t just throw on Formica countertops now because I had already set the sink on top of the hardy backer board that I chose for the tile base. I really was stuck not just with my vision for the project but also concerning what was easily possible to get to completion. Surprisingly, the trigger for a new solution came from 2 sets of Ikea Alex drawers. I needed a better way to organize 2D supplies, and my small black plastic rolling drawers just weren’t cutting it anymore. 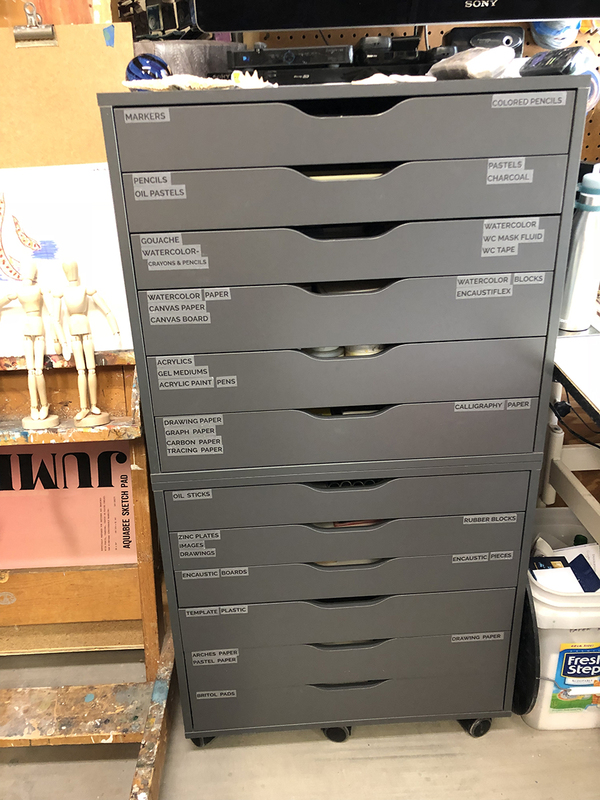 An artist friend who I met at a conference this summer and fortuitously lives in Tucson, had these Ikea Alex drawers in her studio (in white). They were perfect for the space I had. Once they were built, I realized that I just couldn’t live with my half-finished counter project any longer. It was time to let go of the under the sea wonderland mosaic and find something simple, aesthetically pleasing, AND easy to execute. Ikea Alex drawers stacked and mounted together with additional casters to support the weight. 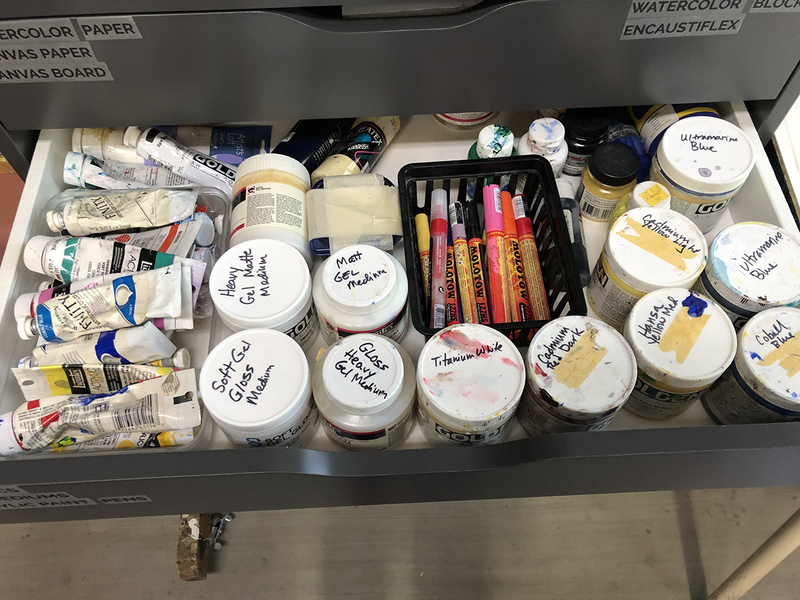 Art supplies fit perfectly in the drawers. Did you know that you just can’t find cheap 6″ tiles anymore? I spent a weekend going to Home Depot, Lowes, and looking online at local tile stores and what small tiles I could find were pretty expensive and all pretty fancy. I didn’t need tiles that could grace the pages of Architecture Digest. And I certainly didn’t want to spend much money. Even in my streamlined solution, I had to be flexible in my vision to get to the finish line quickly. Six-inch tiles turned into 12″ x 24″ tiles because they were the cheapest. Thankfully, I own a tile saw. Finished counter. I beveled tile edges with the tile saw blade at 45-degree angle so edges wouldn’t be sharp. So how long did this project take? Studio remodel. Before and after sink. Excellent pegboard shelf hack–use 10″ straight hooks spaced 4-6″ apart to support painted board shelf. Make the most of a small space. Add sheet metal to the back of the door and cover with chalkboard paint (tinted to match cabinet color) to create a magnetic chalkboard. Use gelato containers to sort art supplies–letter-size full sheet adhesive labels used to create decorative covers. I used my website brand colors and fonts on the labels. 9 years AND 2 DAYS! Yes, seriously. I got it done in less than 2 days and under $50 (that isn’t the total cost but the cost to tile and paint the counters). Yet, I was willing to live with it being only marginally functional for almost a decade. Sigh. Don’t let this happen to you. I was surprised how much of an impact finishing this one project would have. It was a domino effect…completing that years old project led to more items big and small getting done. As I checked off each one, I found that I was more energized and excited about other projects and it also cleared the mental cobwebs away opening me up to more ideas. I started noticing things I had let slide in all aspects of my life. (Apparently, I really don’t dust.) This revelation didn’t make me feel bad or mean I needed to add 100s of tasks to my lists but it did make me see how I had been cutting corners or ignoring, dare I say, pretending that other things weren’t slipping through the cracks. Instead of being overwhelmed by these new observations, I realized that often just 5 more minutes with my routines could mitigate many of them. For example, I added a quick dusting to my routine when tiding up rooms. I had systems in place but just wasn’t consistently following them. I have always loved my studio space. Daily, I am grateful to have my own beautiful studio space no matter the size. But I was surprised how much more joy I feel because of my new countertop when I am in there. Also, the reorganized workstations have made switching between media a breeze. Start small. Make time each week to tackle one unfinished project. Block the time off on your calendar. Prioritize. 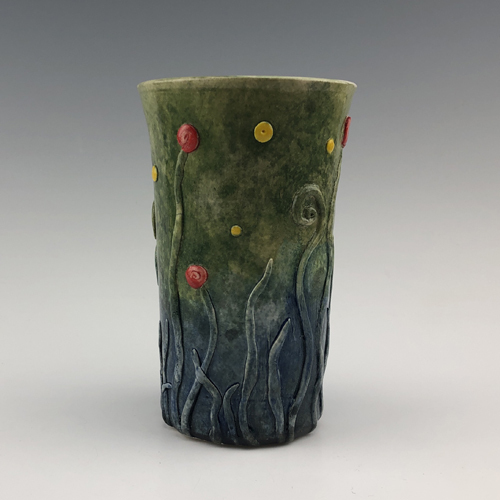 With your first few projects, prioritize not by what you think needs to be done first but by what will be an easy win and what will give you the most satisfaction or relief. Transform any anchor problems. Don’t turn a task into an anchor problem. Let go of perfection and look for additional solutions especially for larger projects or ones that have been hanging over your head for years. Take 5-10 minutes and write down as many possible solutions as possible to that task. No judgment. No solution is too crazy. Set that aside and come back to it in a day or two. This gives your subconscious time to work on the problem and you may additional solutions. Look at the list with this fresh perspective. Which solution makes the most sense? Which can get you to the finish line the quickest with the best result? You may have to do what I did which was change the image of what “done” is. Or you may just delegate it. Hiring someone counts as delegating as does getting someone else in your family or business to do it. If you are a solopreneur, consider hiring a contract person to help out. I finally found a VA (virtual assistant) this year. There are times when I have lots for her to do and other times not. I found one that is flexible and that makes all the difference. Track your progress. Have a completion notebook or notes on your phone. Every time you get something done add it to the list with a date completed. This is the opposite of a to-do list. This is your new “I rock” list. It is such a pick-me-up to look back and see all that you have accomplished in a week, month or year. It is motivating. It also quells the crab in your head that tells you that you aren’t accomplishing enough. Celebrate your wins. Find ways to reward and celebrate your progress. If you live with someone, let them know that you have made a commitment to clear unfinished projects and you could use a cheerleader. Enlist a friend to be a cheerleader if you live alone. Call or text them when you get another item checked off. Offer to do the same thing for them. This could develop into an accountability buddy relationship but it doesn’t have to. Just having someone to give you a high five when you get something done does wonders for your motivation! Reward your consistency. Schedule a reward for sticking to your plan for a month, for example. Reward suggestions: going out to a movie or dinner, a massage, buy yourself a little present, go do something fun like hiking, etc. Be creative. I have rewarded myself with new planners, art supplies, new exercise clothes, bowling (hey, I grew up in Milwaukee, the self-proclaimed bowling capital of the world, so don’t judge me ), a yoga class, an afternoon at the local arboretum, and more. Having unfinished projects hanging over our heads weighs us down so much more than we realize. 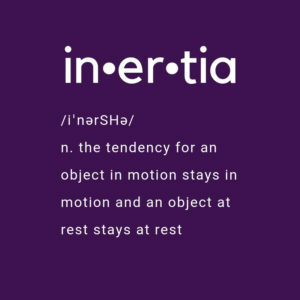 Get inertia working in your favor. Get completion in motion and start reaping the benefits today. I encourage you to complete one lingering project before the year’s end. Share your progress with me so I can cheer you on!